Inflation is a period of rising prices. Most Central Banks target low inflation. If inflation rises above this inflation target, there are several economic policies, such as monetary policy to reduce the inflation rate. Monetary policy – Higher interest rates. This increases the cost of borrowing and discourages spending. This leads to lower economic growth and lower inflation. Supply side policies – These aim to increase long-term competitiveness, e.g. privatisation and deregulation may help reduce costs of business, leading to lower inflation. 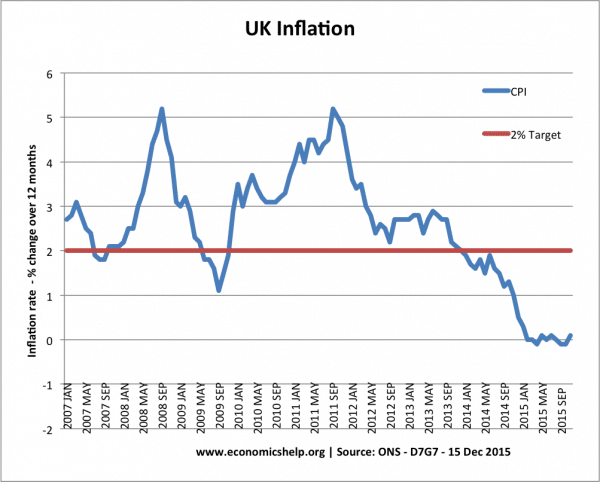 In the UK and US, monetary policy is the most important tool for maintaining low inflation. In the UK, monetary policy is set by the MPC of the Bank of England. They are given an inflation target by the government. This inflation target is 2%+/-1, and the MPC use interest rates to try and achieve this target. The first step is for the MPC to try and predict future inflation. They look at various economic statistics and try to decide whether the economy is overheating. If inflation is forecast to increase above the target, the MPC are likely to increase interest rates. Increased interest rates increase the cost of borrowing, discouraging consumers from borrowing and spending. Increased interest rates reduce the disposable income of those with mortgages. Higher interest rates increased the value of the exchange rate leading to lower exports and more imports. This is another demand side policy, similar in effect to monetary policy. 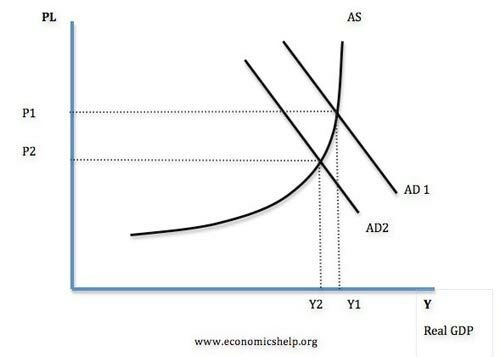 Fiscal policy involves the government changing tax and spending levels in order to influence the level of Aggregate Demand. To reduce inflationary pressures the government can increase tax and reduce government spending. This will reduce AD. In the late 1980s, the UK joined the ERM, as a means to control inflation. 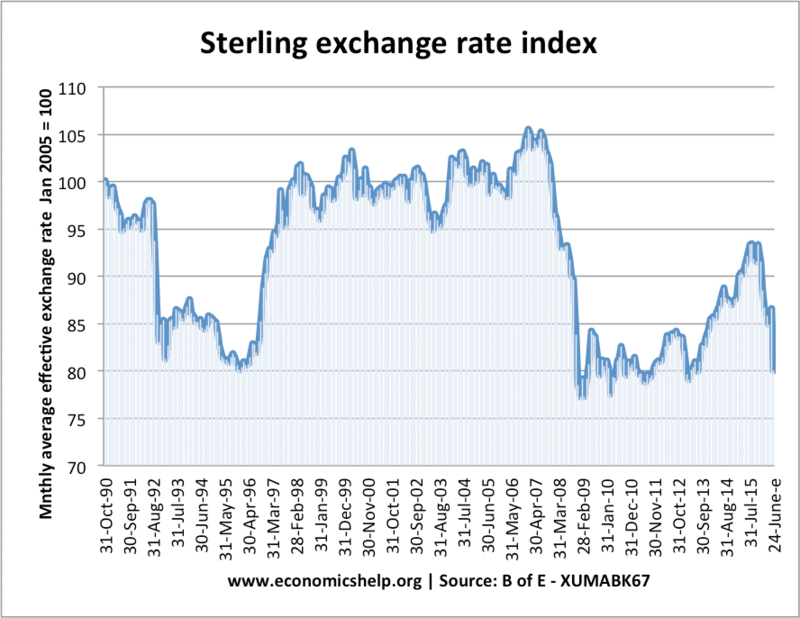 It was felt that by keeping the value of the pound high, it would help reduce inflationary pressures. Stronger Pound reduces domestic demand, leading to less demand-pull inflation. A stronger Pound creates incentives for firms to cut costs in order to remain competitive. The policy did reduce inflation but at the cost of a recession. 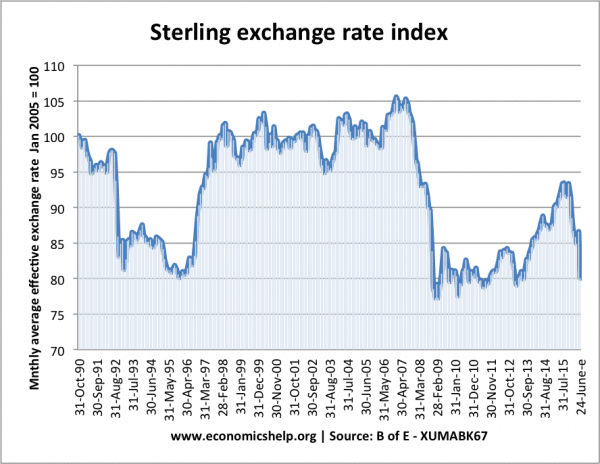 To maintain the value of the £ against the DM, the government had to increase interest rates to 15%, and this contributed to the recession. 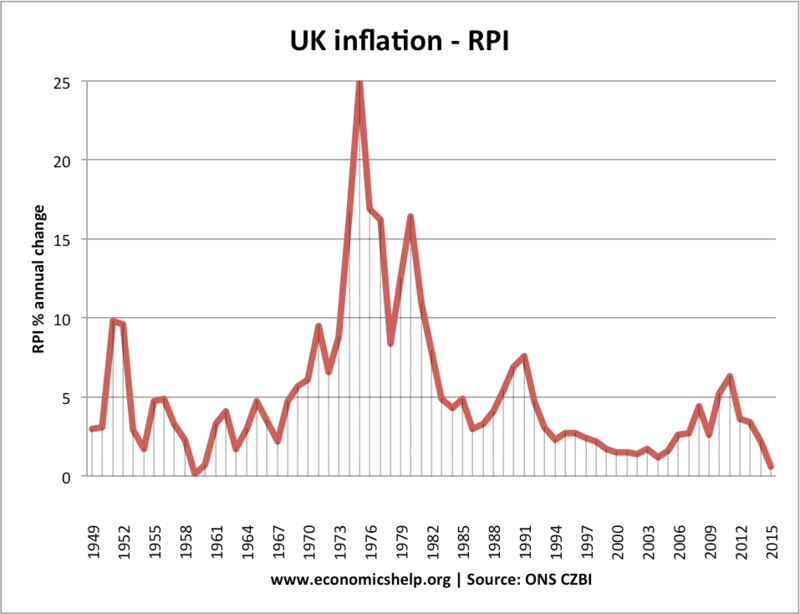 The UK no longer uses this as an anti-inflationary policy. Wage growth is a key factor in determining inflation. If wages increase quickly, it will cause high inflation. In the 1970s, there was a brief attempt at wage controls which tried to limit wage growth. However, it was effectively dropped because it was difficult to enforce widely. The inflation was expected to be temporary – caused by rising oil prices, rising tax rates and impact of devaluation. Economy in recession. With the economy in recession, the Bank of England didn’t want to reduce aggregate demand because it felt it was more important to boost economic growth. In these cases of cost-push inflation, it is harder to reduce inflation, and it is maybe better to let the temporary inflation factors come to an end. Inflation is needed in South Africa to help people learn how to tighten their belts by saving more often and persevering goods that are healthy to the people, walking instead of driving and eating at home instead of restaurant, and investing more time on increasing foreign interest rates by investing ideas and team building activities that will generate an influx in the economy such as hosting a international sport event and encouraging business man and women to boast the economy by being more resourceful and spending less yet gaining net profits , using technological means sparingly and using supplementary methods to better the economy and to also educate more and employ more youth development facilities without wasting money and making means to secure safety for foreigners.